This is a tip on how to get Autodesk Knowledge Base content, hotfixes, tips, and service packs on multiple applications without getting doubles as a RSS feed. Typically a CAD Manager or the like have need for this. Another help to avoid information overload. As you can see there are two or more identical posts in the feed. That is common with the AutoCAD and Revit based products that has several verticals. Using Yahoo pipes you can solve this. I filter non-unique items based on the title of the post. And here is the result, just the way I want it. acdbmgd.dll contains ObjectDBX/RealDWG managed types (everything to do with manipulating drawing files). ObjectDBX is useful because you directly access the DWG file without adding the extra resources needed to actually show the drawing. This means that the performance is really good. All entities, objects based on AcadObject and dictionaries can be accessed. You cannot have a freestanding application that uses ObjectDBX unless you have AutoCAD running. Either a DLL must be created that is loaded from within AutoCAD with the NETLOAD command or you need to use ActiveX to access or connect to ObjectDBX using the AcadApplication object and the GetInterfaceObject method. ObjectDBX is actually renamed to RealDWG and if you need to use it without having AutoCAD you need to purchase and license it. RealDWG does not require the presence of AutoCAD software. RealDWG 2008 is the latest version available now. Below is a sample that starts AutoCAD 2008 and opens a drawing with ObjectDBX. See also ObjectDBX sample using VBA and AutoCAD 2008 and Copy dimstyles between drawings using VBA for other posts how to use ObjectDBX. One way is to use old telnet.exe like this to find out if a port is open. You can also try the IP of the computer, server or host. You must be able to Ping that address. If the window hangs while saying "Connecting ..." and then goes away, the port is not accessible. If the window instantly goes away, the port is probably not accessible. If the window display text, like "220 ESMTP spoken here" or just shows an empty window the port is open. But if you have Windows Vista or Windows 7 you probably don't have telnet because it is not installed as default. Click Start, Control Panel, Programs, and then Turn Windows Features on or off. In the list, scroll down and select Telnet Client. Click OK to start the installation. Or you can just run: start /w pkgmgr /iu:"TelnetClient"
Now you should be able to check if a port is open or closed or not accessible. If it is not accessible start checking if the firewall is the issue. Just wanted to share this problem that can show up if you are developing using for for example VB.NET or C# and want to force a custom date and time format. The problem can show up with format specifiers %t that represents the first character of the A.M./P.M. designator or tt that represents the A.M./P.M. designator. Notice how PM is missing if the culture is Swedish. MyString returns "sep 12 at 5:30 "
The solution is to set the culture to one that supports AM and PM like en-US and then you can restore it to what it was before. MyString returns "Sep 12 at 5:30 PM"
Did you know that you can run a script (.SCR) file automatically when changing workspace in AutoCAD? Using the Customize User Interface (CUI) it's not possible. You can only specify LISP files to be loaded together with the customization file. If you have hard to locate the CUI file you can just run the CUI command and you will find the file path and name. Using XML Notepad 2007 locate the Workspace that you want. The UID has the name. In this case WS_Anno2DDraft. Right click on UID and select Attribute>After and enter Script and then enter the script file to be loaded. Or you can edit using Notepad or the like. Search for "<Workspace ". Notice the space after Workspace and don't include the quotation marks. Then add what is marked as bold below changing the path and name of course. Thanks for the tip Chris Dodge, Microdesk.com. It's easy to get a feed for comments even if the blog (powered by Blogger and looking like this http://myblog.blogspot.com) does now show any feed for the comments. Reading Deelip's post got me thinking about sharing this tip. So for Deelip the comment feed would be as the above. Just changing myblog to deelip. Does only work when hosted on blogspot.com. Then of course the feed can be burned using Feedburner. To the right on my blog you can see the 5 latest JTB World Blog Comments. PS. I have also as many others made use of Talkr so you can listen to the posts. See the link Listen to this below. There is also a podcast feed available. Found via the site for Autodesk 3D Launch Tour that I found via Nvidia's newsletter that also mentioned the driver ForceWare Release 163.69 WHQL for Vista 32-bit. Visualize, then realize your projects with Autodesk software. The Autodesk Media & Entertainment Software Launch tour kicks off August 29, but where it goes is up to you. Highlighting the latest versions of Autodesk® Maya, 3ds Max, VIZ, MotionBuilder, and Toxik software, the tour features product demonstrations and esteemed guest speakers at a dozen venues across Canada and the United States. A minor update of SmartPurger that makes sure to close some more popups like "Previous Version MEP Objects Detected" and the Customer Error Reports when needed. An issue with AutoCAD Architecture 2008 is that it crash when starting and closing it with the use of a script file. The error in acad.err is: "INTERNAL ERROR: Attempt to access AecUiBaseServices after shutdown!" It seems like the SCR file is loaded and run before the palettes are loaded. And the problem is probably related to _aecprojectpalettestartup, _aecprojectnavigator or ProjectNavigatorOnce. Here is the solution that also works with ScriptPro or other batch/script applications. First start AutoCAD Architecture. Close the active project using the Project Browser and right click on the project in bold and select close current project. Close AutoCAD Architecture. Now you can run SmartPurger without getting these crashes. Get AutoCAD Architecture 2008 SP1 here. It also includes what is in the AutoCAD 2008 SP1. I've used it for a while and can recommend to install it. PS. If you have the beta version of SP1 you would uninstall it first. Yes, the SP is uninstallable. Look at the image below. What is it? Three circles? Yes it look like that but it's not. Running DISPSILH and setting it to 0 followed by a REGEN and the result is as follow. But is it the full truth? No. And if DISPSILH is set back to 0 this is the result. Notice the silhouette edge of the sphere on the above image and how it is missing on the one below. Controls display of silhouette edges of 3D solid objects in a 2D wireframe or 3D wireframe visual style. You can use the REGEN command to display the results. DISPSILH also suppresses the mesh displayed when using the HIDE command in the 2D wireframe visual style. Sets the surface density for PEDIT Smooth in the M direction and the U isolines (or V isolines) density on surface objects. Valid values are 0 through 200. Meshes are always created with a minimum surface density of 2. ClassificationDefinitionTools is now available. With it you can import or export classification definition structures. It works for AutoCAD Architecture (ACA), Architectural Desktop (ADT) and their verticals. Some classification structures can be very large and complicated and this tool can help to avoid the need to type everything manually. You can use existing lists in Excel and just copy and paste. PaletteHoldopenDelay does not affect all palettes though probably because not all development teams at Autodesk knows about PaletteHoldopenDelay. You can see the effect with the palettes Properties, Quickcalc, External References, Sheet Set Manager, Markup Set Manager, Visual Styles Manager set to auto-hide. Try for example CTRL+1 one or two times. But it seems to only affect External References when starting AutoCAD. This was found trying with AutoCAD 2008 SP1. If the basics is not enough here comes most everything else worth knowing about hyperlinks in AutoCAD. Here is a sample code that can be used in CUI (Customize User Interface) as a Double Click Action macro instead of the default one ^C^C_properties. If the object has a hyperlink it will be opened and if not the Properties palette will be opened. It will open MyBook1.xls, sheet1 and locate the cell C10. To find all objects that are hyperlinked use QSELECT and since there is no operator to select all objects with a hyperlink you can select Not Equal and enter a Value you know does not exist. Notice that you have an Area option. That will ask you for First corner and Other corner and create a 3D Polyline on the layer URLLAYER. The URLLAYER is automatically created. When is this useful. For example if you plot to DWF you will find that you can click anywhere in that area and the 3D Polyline will not be visible. If a drawing has had hyperlinks the Registered application PE_URL can be purged. HYPERLINKBASE - Specifies the path used for all relative hyperlinks in the drawing. If no value is specified, the drawing path is used for all relative hyperlinks. Or use DWGPROPS and on the Summary tab, enter a relative path in Hyperlink Base. HYPERLINKOPEN - Asks for a hyperlink and opens it or navigates to that location that could be a named view or layout tab. PASTEASHYPERLINK - Inserts data from the Clipboard as a hyperlink. Example. Copy a file in Explorer and run the command or select Edit>Paste as Hyperlink and then select one or several objects. Now a hyperlink to the document will be inserted on the object(s). And now into more details how to use entget to find the information. The hyperlink information is attached as xdata. And this is an example how the hyperlink is to the view named Detail 1 in the current drawing. To make sure the option Convert Hyperlink to DWF is always set the code below is needed. Here is how a hyperlink can be attached to an object. There are other methods as well using Visual LISP extensions to AutoLISP (vl-load-com). Hyperlink.URLDescription = "Autodesk Main Site"
ThisDrawing.SummaryInfo.Comments = "Includes all ten levels of Building Five"
ThisDrawing.SummaryInfo.Subject = "Plan for Building Five"
This little tutorial will cover most basics around hyperlinks followed by the more advanced topics. With the HYPERLINK command you can attach hyperlinks to most any object in AutoCAD. Useful applications of this is to hyperlink a section or detail marker to the actual location of the section or detail that can even be in another drawing. Another use is to add a description or tooltip to a column line of a grid system so you can see that you now have column A even though the column bubble is not visible. The link can be to a file or website, a named view or layout tab, even an e-mail address. The command is available with the common shortcut CTRL+K as in most other software's. Or from the Properties Palette. If you select to link to a drawing you can click on Target and specify a named view or layout tab in that drawing. If you select an object with an existing hyperlink a button comes up showing "Remove Link"
When an object has a hyperlink you can open it using CTRL+click to follow link. You can even have a block or xref with multiple objects with different hyperlinks and it works. If the blocks contain any relative hyperlinks, the relative hyperlinks adopt the relative base path of the current drawing when you insert them. Or in the Properties Palette. But this one does not show nested hyperlinks within blocks. A neat tip is that you can use the hyperlink to just show information about the object. In the above case use the hyperlink just as a tooltip consider removing the option "Convert DWG hyperlinks to DWF" unless you really want to see these tooltips in the DWF file as well. Just know that if you try to follow the link you will get an error like this in Windows Internet Explorer "Cannot find 'file:///C:/Documents/TANK1A205'. Make sure the path or Internet address is correct." Another great usage is that if you import the dwg file in NavisWorks you can select to have the hyperlink showing as a tooltip as well. Great for showing information like tags, position numbers, room numbers, etc. With the the quite new Field functionality you can embed hyperlinks in text or mtext objects. Right-click in the text editor. Click Insert Field. Or run the FIELD command. In the Field dialog box, in Field Category, select Linked. In Field Names, select Hyperlink, and click Hyperlink. What about if you don't see the hyperlinks? In Options>User Preferences you must select to Display hyperlink cursor, tooltip, and shortcut menu. The PICKFIRST system variable must be set to 1 to open files associated with hyperlinks. AutoCAD hangs and the only way I know is to kill the acad.exe process. I tried this in AutoCAD 2004 as well and the same problem there. I'm so used copying a path from for example Explorer and paste it to dialogs like this. Have you this problem or not? Alignment axis is automatically determined when possible. The longest side of a rectangle is selected as alignment axis. Negative extrusion depth is allowed and makes the mass element extruded the other direction. The layer checkbox remembers its setting between sessions. I got a comment in my post AutoCAD Palette Auto-hide Speed freeware where I got the question to support PaletteHoldopenDelay that somehow should set a delay for the Palette Holdopen what that now is. This functionality was mentioned at Between the Lines. I tried to see the effect of “holdopen” in AutoCAD 2008 but I cannot see what effect it has. When/how do you see this effect? Please let me know if it works for you and how. I'm posting this from the new Windows Live Writer. I had a comment to my earlier post about a fix for the spelling (spell checker) to work. The comment said that the fix didn't work now. I have made an update to it now and heard back from him that it worked just fine. In my own tests I have not needed my fix for the spell checking to work. Among other things the problem with adding drop shadows to images has been solved. But as often is there is also an introduced bug. Notice how the category AutoCAD Architecture 2008 is clipped in the image below. TimberTool by JTB World that is an add-on to ADT 2007 or ACA 2008 now supports imperial units as well as millimeter and the mass element can inherit the layer of the polyline. The product was initially created for usage with timber but works with structural steel or concrete shapes. See this short video on how it can be used. Annotation scaling is one of the greatest news in AutoCAD 2008, AutoCAD 2008 LT and all verticals. Text, Mtext, Dimensions, Leaders, Multileaders (new), Tolerances, Blocks, Attributes, and Hatches can now be presented in different ways depending on the annotation scale. Things that been quite difficult and error prone before AutoCAD 2008 are now really easy. Typical usages are details in different scales. Room numbers on plans in different scales but with different text size as well as location when needed. Notice below how the room text is visualized in different sizes and angles and if you make a change to the room description it changes on both views. Lynn Allen also has an article on Cadalyst. Circles and Lines: Awesome Annotation Scaling. Here are some hints for the AutoLISP programmer or scripter. The standard scale list in AutoCAD 2008 is unfortunately hard coded so you cannot change that one. You can set up your templates having only the scales you want though. The scales can be added and deleted using different methods. Some samples how this is implemented can be found in the newsgroups. ScaleListDel.lsp here, Here and here. 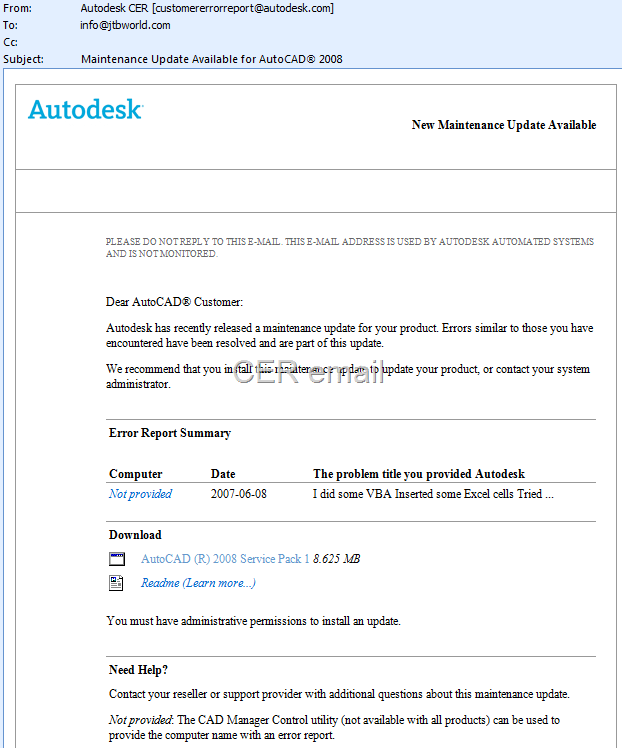 AutoCAD 2008 Service Pack 1 that actually fixes a problem when you got XREF_XREF_XREF scales when using nested xrefs. It does not fix existing drawings though. So how can it be handled in a better way technically speaking? Referencing to the previous post. Saving passwords in a database as plain text is really a bad idea. Should the passwords be stored in the database encrypted? No, that is not safe either. way to "unhash" something into a password again if you need to retrieve it. The only thing that can be done is to validate that the password is correct by hashing it and comparing it to the saved hash value. That is why some sites offer you to reset the password but they cannot show you your password. System.Web.Security namespace has the FormsAuthentication.HashPasswordForStoringInConfigFile Method. hashMethod can be either "MD5" or "SHA1"
But this is still not enough. What if two or more users has the same password. That means that if you manage to get the password from one user you automatically have the password for other users with the same password. This can be exploited in a so called dictionary attack. Why is that? Most users actually uses simple passwords that exists in a dictionary. What the hacker does is to create hashes of a lot of words or passwords and can then compare these hashes to the hashes saved in the database. Salting hashes is the next step to take. That means that a random string is generated and combined with the password and then hashed. So each user credential row has both a hash as well as a random salt string saved in the database. This will make all hashes unique. This makes it a lot harder for the hacker since he would have to hash all his maybe 1,000,000 dictionary entries with the salt of every user row. That will take so much more time. So the tip for those that want makes websites that needs to register users or needs to validate passwords one way or the other, do not ever save a clear text password in your database, hash it and use a bit of salt. There are also other ways to handle web authentication. Take a look at Windows CardSpace and OpenID. OpenID is something you will see more of on Internet, that is for sure. Many websites require that you register and provide a password. How safe is that? I just signed up on a site and after registering I got a message like this: "We have sent a message to this address and providing you with a copy of your password." And the email said: "You chose to register with the following email address: .... You chose the following as your password: ***********". But with the password in clear text of course. When you can be emailed the same password as you have selected you know their solution to save passwords is not the safest one. Why is that? If some hacker breaks in to their database they can also get all passwords without much problem. Tip is to always use completely different passwords wherever you register. A strong password should appear to be a random string of characters to an attacker. It should be 14 characters or longer, (eight characters or longer at a minimum). It should include a combination of uppercase and lowercase letters, numbers, and symbols. Here is a good article on Strong passwords: How to create and use them and an online Password checker. For more technically details see this post. Not really CAD related but when I read about 3D spam I had these thoughts, who knows if DWF gets as popular as PDF that we might see spam in form of 3D DWF files just like we get PDF spam now and obviously 3D spam.